This fund raiser challenge supports charity, details in section "main project"
If you wish to donate as well, that's a bonus. Visitors are welcome to the Centre, it's a small cost to sponsor morning tea and have a laugh with the kids (little monkeys). The centre is a "Day Care" centre for approx 80 children aged from 1yr to 8yrs. the extra price lets us include photos and a banner of your company for social media. Ultimately we'd love to see you or your team make a visit, perhaps part of your team building tour which the B.PAC team can service. Two (2) story building with offices and outdoor play area catering for approx 80 children betwene age of 1 and 5. 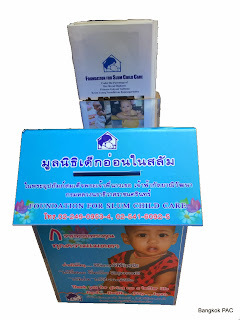 Visitors are welcome to the centre, if you wish to sponsor a lunch (from as little as 1,000baht 10 kids) please contact the centre for details. Community Inspection programs are available; accompany FSCC support team to visit families in the slum area, please note this is by appointment only.